At The Academy of Arts & Knowledge, Fort Collins’ premier charter elementary school, we have a deep and profound love for art in all of its forms, including the art of the written word. The ability to read, and to enjoy doing so, is an important skill that everyone needs. Not only is literacy a basic skill needed to do almost anything, but reading can also help your child be happier, better informed, and a more curious and interested student. Read on for the first part in a series about ways that you can help foster a love for reading in your child’s mind. If you are interested in learning more about our charter school, please check out the rest of our website. While you’re here, you can read about what our goals as a school are, how and when to apply, and find pages devoted to introducing our group of dedicated educators. If you have any questions, please feel free to contact us. If your child seems disinterested, or even outright hostile, towards reading, it can be difficult to know how to start changing their thoughts about such a valuable skill. One way to foster an interest in reading is to find books that are related to subjects they are already interested in. If you have a big dinosaur or pony fan at your house, look for books that balance great artwork with fascinating facts about their favorite creatures. While we understand that scheduling something that is supposed to be fun seems counterintuitive to us as adults, schedules and structures are incredibly important to helping a child’s mind develop and learn good habits. If you designate a certain time as reading time, you might be surprised at how quickly your child’s negative or apathetic feelings about reading shift towards the positive. If your child doesn’t like reading alone, read to them until they are comfortable and happy to read by themselves. If you are a big reader, you probably have a lot of books, magazines, and maybe even newspapers in your home at any given time. While you might not know this, just having reading materials around can help your child develop an interest in, and passion for, reading. When they see books around, they will be curious about them. Make sure to keep books for your child around and easy to access. Even if they aren’t a strong reader yet, picture books can be a great way to get them interested in learning how to read or learning how to read better. 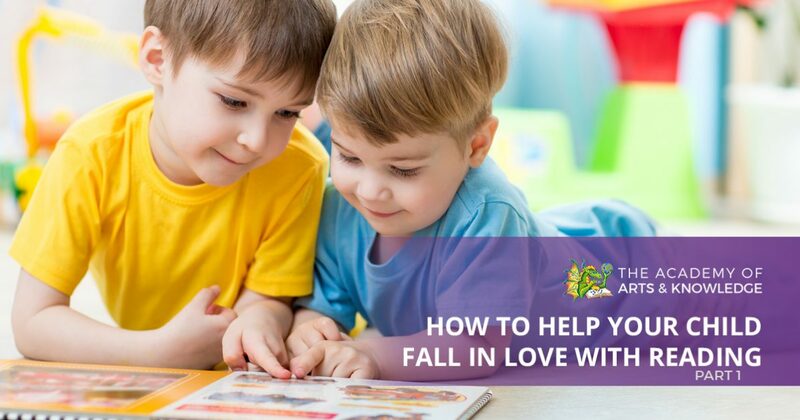 Come back soon to check out part two of this blog series where we discuss even more ways to help your child develop a deep love for reading. If you want to find a wonderful charter school for your elementary-age kids, be sure to check out The Academy of Arts & Knowledge in Fort Collins. We offer a full curriculum that uses the arts as a way of illuminating the world. Visit our website today to learn about enrollment dates!